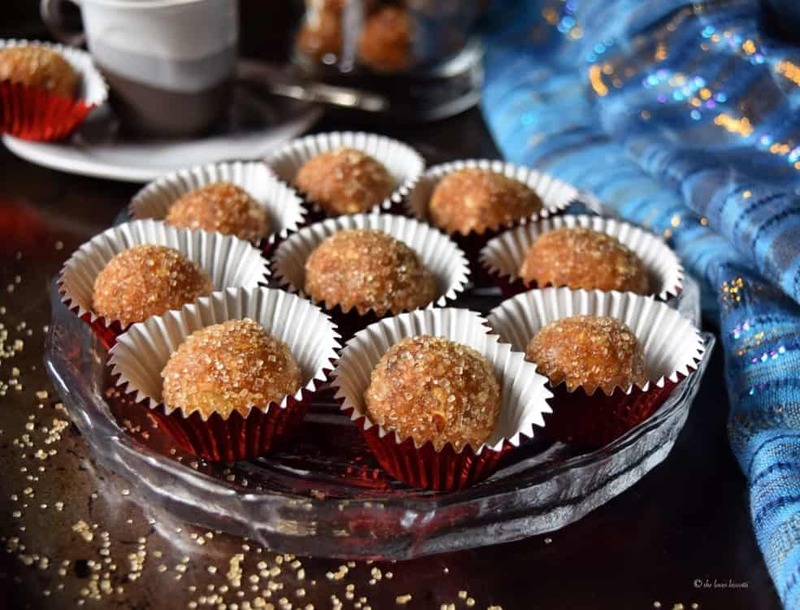 No matter what visions of sugar plums you might have dancing in your head …I would like to suggest the following … a no-bake holiday treat made with dried fruits, nuts and fragrant spices. 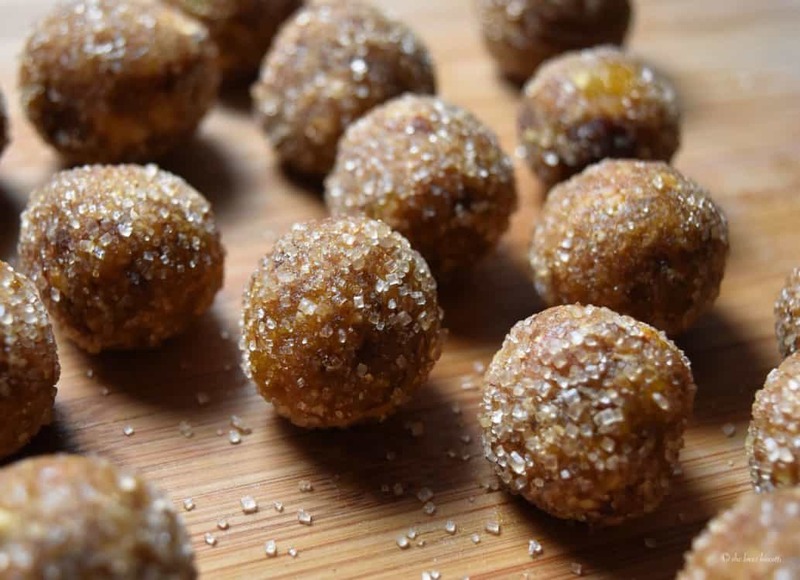 More specifically, how about a recipe for No Bake Almond Date Apricot Sugar Plums. 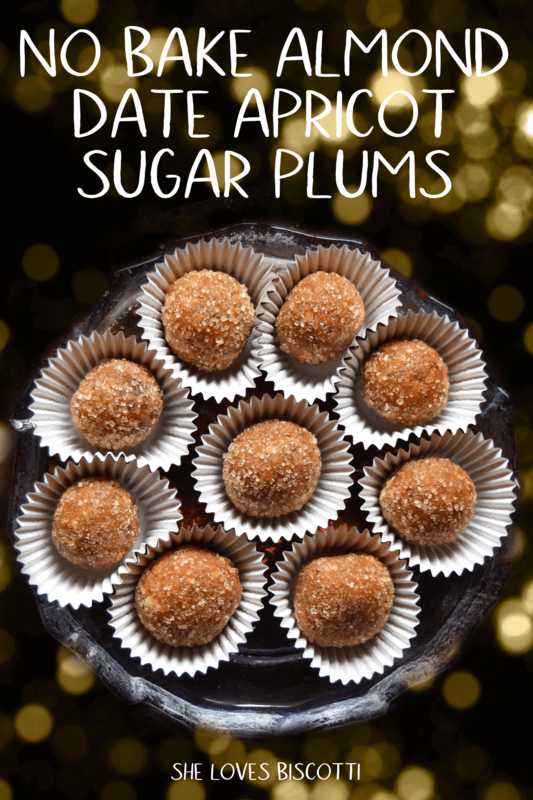 I’m guessing this is not the vision of sugar plums that you may have had …but I assure you, this one is worth exploring …and the best part -this recipe comes together in under 30 minutes. It all starts with some roasted almonds. I don’t know about you, but we can easily go through that big bag of Costco almonds in one month. Homemade Almond Butter, Cocoa Dusted Almonds and of course the Almond Biscotti are just a few of the recipes that I make on a monthly basis. And with the holidays quickly approaching …well we usually consume a lot more almonds! So, once you have coarsely chopped up the roasted almonds, it’s simply a matter of measuring and chopping up the other ingredients. In actual fact, I prefer to use my kitchen shears to “cut” the dates and the apricots before I place them in my food processor. In the past, I have tried using my knife to give them a quick chop but due to the nature of these wonderfully sticky foods, it’s a cleaner cut with the shears. Place all of your ingredients in your food processor and pulse until your mixture forms a clump; transfer this fragrant mixture and with the use of the smallest scooper, it’s time to dish out some sugar plums. With damp hands, roll each section into a 1 inch ball. 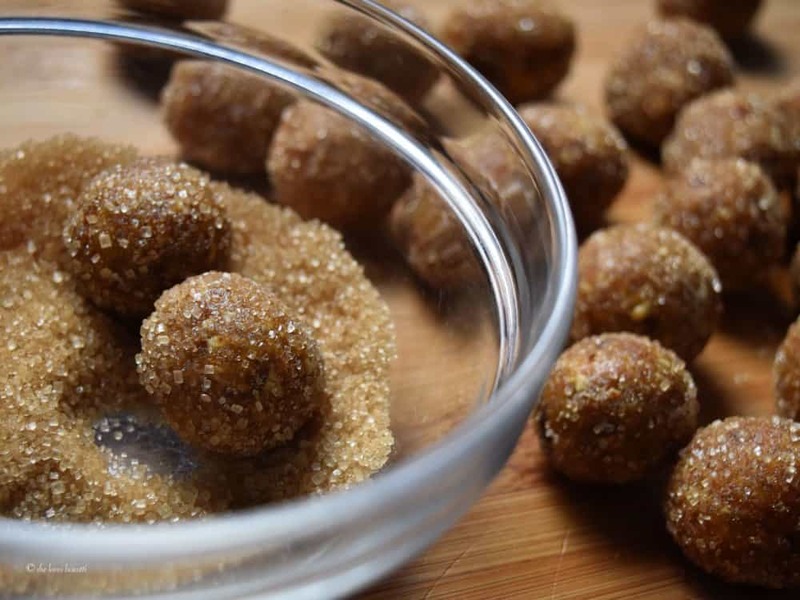 Once this is complete, roll each individual ball in some coarse sugar. Feel free to make smaller or bigger balls. 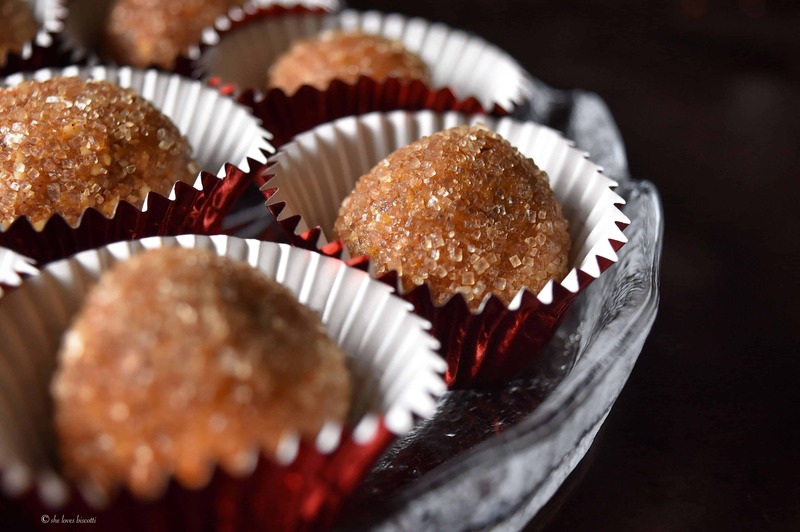 You can also roll these No Bake Almond Date Apricot Sugar Plums in icing sugar, desiccated coconut or for more decadence, chocolate. Today, I decided to use turbinado sugar. See how easy that was! When I am ready to serve them, I like to place these little glitter balls in festive truffle liners. 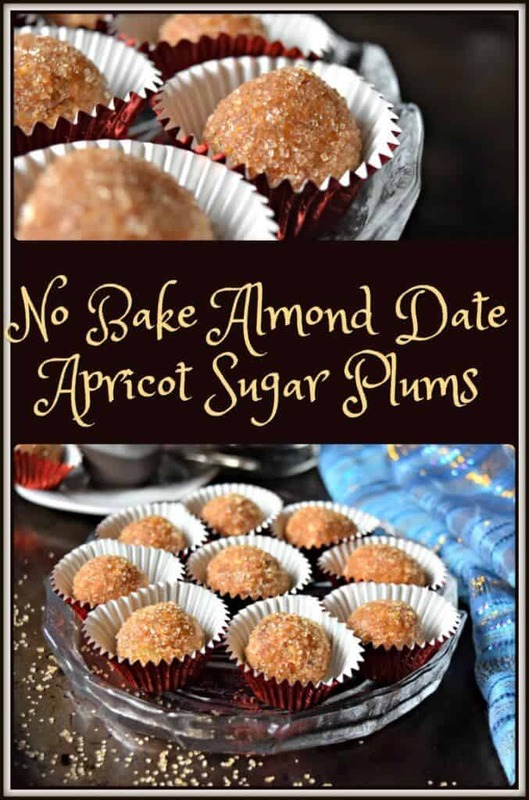 I found the original recipe for these No Bake Almond Date Apricot Sugar Plums in a Canadian magazine called Homemakers. Unfortunately, this magazine is no longer in publication, but for the decade or so that I had my subscription, I picked up some wonderful recipes. After so many years, they are still appreciated by family and friends. The original recipe did not include any spices. So I added a hint of cinnamon, allspice and nutmeg along with the zest of an orange. 5-As long as you keep the proportions of nuts and dried fruit constant, you can easily swap some of the ingredients. Dried cranberries, raisins, prunes, walnuts, etc …are all wonderful alternatives. 6-They can be made well ahead of the holiday rush and frozen. When putting your Holiday platter together, it’s just a question of removing them from the freezer and rolling them in some glittery sugar. How convenient is that! My holiday cookie platter would not be complete without these chewy, fragrant No Bake Almond Date Apricot Sugar Plums. Enjoy! 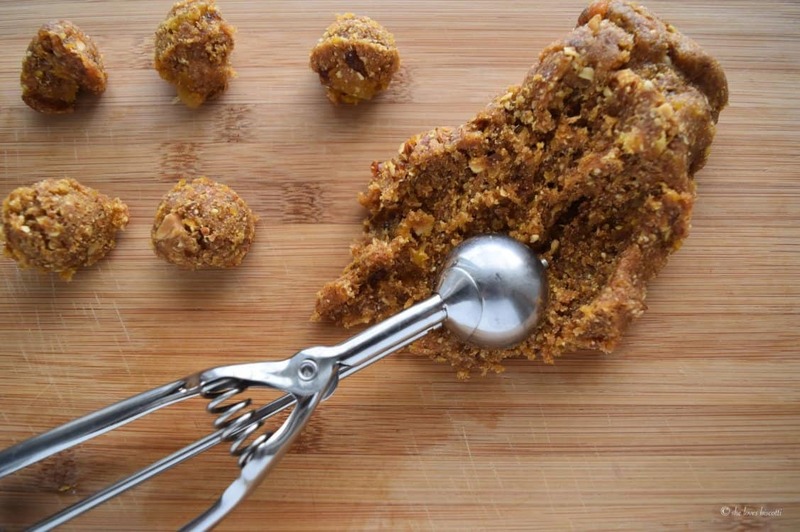 In a food processor, combine the roasted almonds, dates, apricots, orange zest and spices. Cover and pulse until mixture is transformed into a paste. 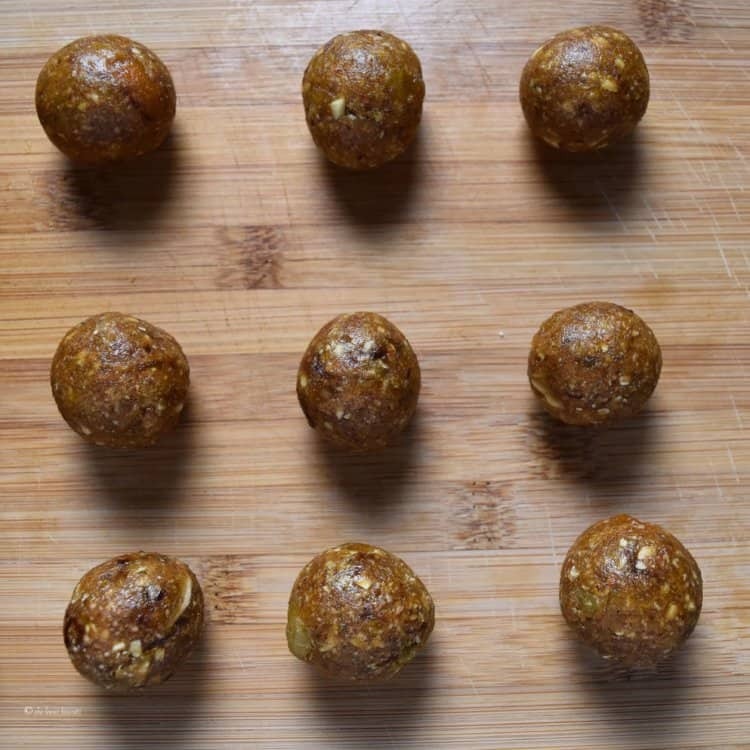 Roll mixture into a 1 inch diameter balls (about 1½ tablespoon). Store in an airtight container in the refrigerator for 2 weeks or can be frozen (WITHOUT rolling in the sugar) for up to 3 months. To roast almonds: Place almonds in a single layer on a baking sheet in a preheated oven at 300℉ for about 20 minutes. Move almonds around a few times while they are roasting. Thanks for this recipe – I’ve been looking for it for ages! My mom made these back in the late 1970s/early 1980s and she certainly subscribed to Homemakers magazine (we were from Burlington, Ont); I have a childhood memory of the sugar coating having a pinkish hue … I suppose I could try to find a coloured sanding sugar! I usually avoid making dessert because there are so many opportunities for it to go wrong but these look really easy to make! 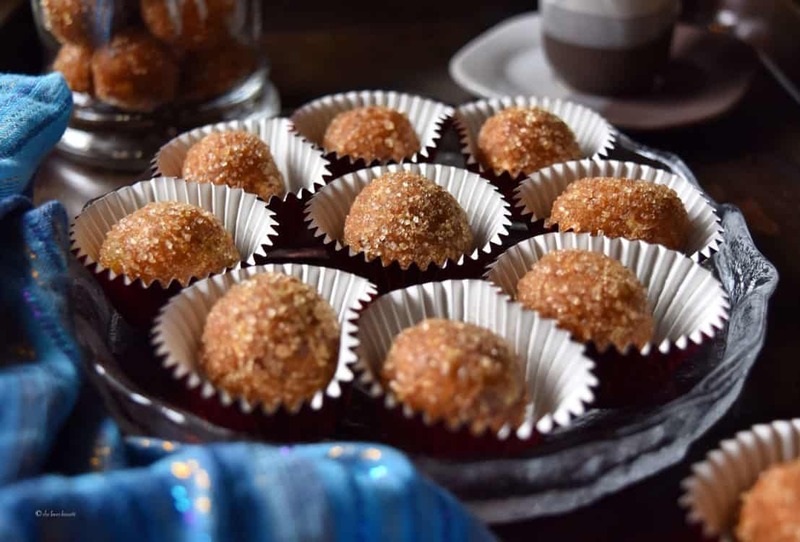 I have a number of similar recipes in my repertoire and I love them at holiday time because 1. they are so easy to make and 2. they are gluten free which is useful for when your guests can’t eat gluten – so many holiday dessert tables are full of things they can’t eat! A no-bake holiday treat for the cookie plate? That is genius!! Love how these glitter on the plate, I think that they will be a great addition to our cookie plates this year! I’m all about almond for dessert! and plum or dates with it just is the perfect match! With a touch of yours (cinnamon) and nutmeg to make it a perfect contender for the desserts table this holiday season! 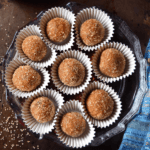 Absolutely every ingredient that I adore – gluten free and vegan as well. 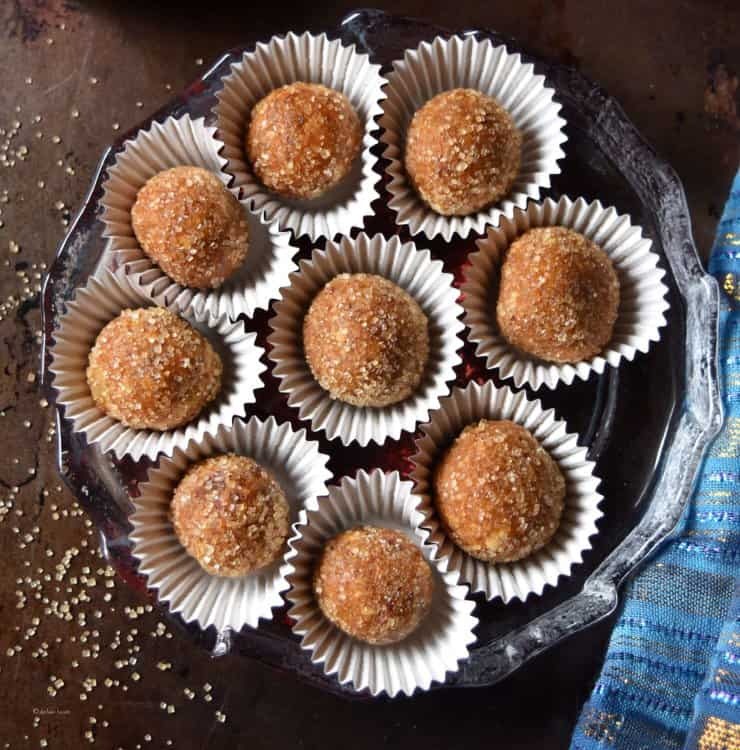 In one delicious bite you have brought your readers something quite special. Quelle belle recette, j’ai hâte de la faire pour mes réceptions du Temps des Fêtes. Merci Maria pour le partage!